Golden Dynasty is opulent and decorated in warm simplicity with a pleasant and relaxed ambience. The restaurant’s prime location, just at the back of the Leicester Square, makes it a prime choice for all visitors to Soho or Covent Garden. In additions to the main dining room, it also features three function rooms kitted with karaoke systems and large screens. In true Chinatown style this restaurant brings the passion and culture of China. It serves both main courses and Dim Sum to please a steady flow of diners all through the day. The service is professional and attentive with the waiting staff willing to help you choose from the long and detailed menu. The décor features Chinese paintings hung on neutral cream walls and darkwood furniture, softened by spot lighting to create a smart, modern dining room with a cosy interior. Golden Dynasty is perfectly located in china town with many surrounding pubs and clubs perfect for post dinner drinks or those that would like to dance the night away after a hearty meal. Nearest tube is Leicester Square. Tourist attractions near Golden Dynasty include the National Portrait Museum and National Gallery. This is a unique venue with a funky take on the usual Chinese d�cor. The restaurant has three spaces known as the Karaoke rooms each with its own karaoke system, including a nice big screen for you to follow the lyrics on and comfy sofa booth�s to sit on. The smallest Karaoke room can host up to 12 people the medium karaoke room 20 and the large karaoke room 30. With a modern, contemporary feel, Golden Dynasty is a great place for private or corporate parties. The main restaurant at the ground floor can host a party of 80 people sitting down or 120 standing. Golden Dynasty particularly specialize in Dim Sum which is served everyday throughout the afternoon. A full A La Carte menu is available serving a large variety of Chinese food and desserts, with a delicious selection of imaginative specials. 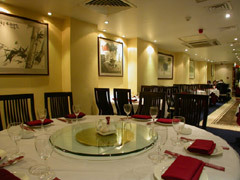 Dishes are beautifully served and there�s a good selection of Chinese and international wines to compliment the food.